There are many types of stomach or gastric cancers but it is fairly rare with around 6,000 people in the UK diagnosed each year. It normally starts with a tumour or ulcer in the inner lining of the stomach and is caused by changes to the cells that produce the stomach juices that help digest foods. If untreated, it can spread to other organs and the risk increases with age. Men are twice as likely as women to develop the disease. Diets rich in smoked meats, high fats and processed foods create higher risk of getting stomach cancer and there is a hereditary link in one in 50 cases. 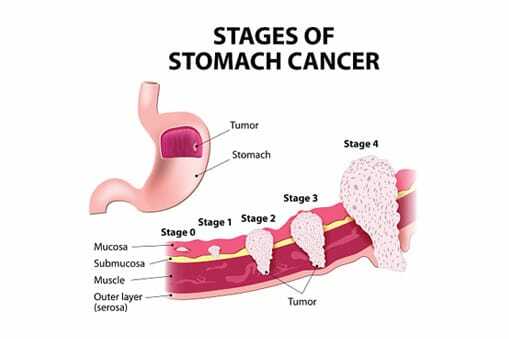 Many symptoms of stomach cancers are similar to less serious conditions with early stage signs being persistent indigestion, heartburn, trapped wind, difficulty swallowing and vomiting. The more advanced signs include blood in your stools, a swelling or lump in the stomach, loss of appetite, weight loss, fatigue, anaemia and jaundice. Around 90% of stomach cancers appear in people aged over 55. It is easier to treat if diagnosed early and GPs are instructed to check symptoms and examine your stomach for any lumpiness or tenderness and to refer to a specialist for further investigation. A GP should also refer you to a specialist if you have indigestion and weight loss. Treatment will vary depending on your general health and how far advanced the cancer has become. The three main treatment options are surgery, chemotherapy and radiotherapy. An operation is usually recommended if the cancer has been detected early and the damaged tissue can be removed. It is estimated that a cure is possible in 20-30% of cases. To ask a question about stomach cancer or to book an appointment, contact our specialist team available Monday – Friday 8am – 6pm and on Saturday from 9am – 1pm.